"Unless God helps us, there is no hope," Captain Morris yelled over the roar of the storm. Hudson Taylor had to agree. Indeed the Dumfries might sink this very day and he would never live to see the shores of China, a land whose people he was certain God had called him to. Hudson survived his perilous maiden voyage to his beloved China. With his heart set in determined obedience to God, and trusting the provision of the One who had called him, Hudson overcame persecution and almost overwhelming personal losses to bring God's truth to the "ripe harvest fields" of China. 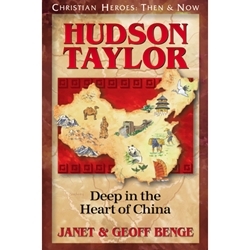 Today, Hudson Taylor's story continues to challenge and inspire believers young and old to carry the anchoring gospel message, regardless of personal trial or hardships, to those who are adrift and without hope. (1832-1905).